Saayad is the story of two generations living together, but experiencing the world in very different ways. Whereas the influence of a sincere, hardworking friend transforms the lives of a group of friends for the better, the arrogance of, and lack of guidance for the newer generation sets another group of friends on a track of drugs, death and destruction. The generational clash reveals how moral authority has become corrupted in Nepali society, and how the alienation of the younger generation is pushing them to anarchy. Acclaimed writer-director Suraj Subba 'Nalbo' has crafted a powerful coming-of-age moral tale, touching upon the dreams and heartbreaks of the young, and the improbable responsibilities of the more mature generations. 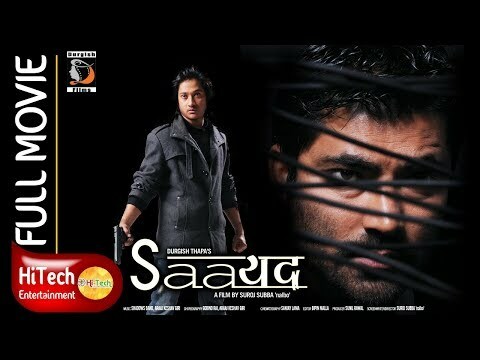 Saayad is a rare gem in Nepali cinema. The movie begins with the news announcement of the decapitation of two BSF jawans by the Pakistan Army and a third jawan Vasu (Vikram Prabhu) missing. The scene then shifts to a Pakistan Army base where a wounded Vasu is held prisoner. He narrates the events leading to his imprisonment. Vasu, who is from a small town in Tamil Nadu, joined the BSF after his graduation to avoid working in his father's (Raj Kapoor) provision store and was posted at the India-Pakistan border in Jammu and Kashmir. One day, he encountered a young Kashmiri Muslim girl Khanum (Ranya Rao) and immediately got attracted to her. After some days, Khanum reciprocated Vasu's feelings, but sadly walked away when Vasu asked her to marry him. The next morning, two jawans were decapitated by the Pakistan Army (which was reported at the beginning of the film), forcing all Pakistanis in Kashmir to return to Pakistan due to rising anti-Pakistan sentiment. Vasu, who was tasked with the responsibility to ensure that all Pakistanis returned safely, was shocked when he found out that Khanum is a Pakistani from Pakistan-occupied Kashmir, who had come to India to visit her grandfather. Later, the bus in which Khanum was travelling was burnt by protestors just a few kilometres from the border, however Khanum managed to survive. Vasu took her to her home in PoK safely via an unguarded border crossing, but was soon caught by the Pakistan Army for infiltrating into their country and imprisoned. In the present day, Vasu finds out that along with him, twenty-three other BSF jawans are held prisoner by the Pakistan Army. One day, he is made to fight one of the imprisoned BSF jawans (Ajay Rathnam). He manages to defeat the jawan, but is then taken to a nearby cliff by the Pakistan Army to be shot. However, a sympathetic Pakistan Army officer, whose daughter's illness was successfully treated by Indian doctors, secretly allows him to escape. Vasu goes to Khanum's village, where he witnesses Khanum's family being killed by a cruel anti-Indian Pakistan Army commander Razzaq Ali Khan (Shaji Chaudhary), who feels that Khanum is a traitor for loving the Indian Vasu. Vasu rescues Khanum and both of them leave for the Indian border, with Razzaq and the Pakistan Army in pursuit. He manages to subdue the armymen as well as Razzaq, but chooses not to kill Razzaq. Razzaq, while accepting defeat, reveals that his opinion of India and Indians will not change. At this, Vasu forcefully replies that despite being an Indian, he does not hate Pakistan and Pakistanis and that the misguided hatred between the two countries only aggravates the India-Pakistan conflict. The movie ends with Vasu revealing the presence of the twenty-three jawans in Pakistan and ensuring their freedom, for which he is honoured by the President as well as the Prime Minister of India. Tabletop (2018) | South Indian Hindi Dubbed Movie 2018 | New Movie 2018 | South Indian Movies Dubbed in Hindi Full Movie 2018 New Prabhu (Siddharth) and his friends discuss the route from Bangalore to Chennai and plan to kidnap Rithika (Ashrita Shetty). Meanwhile, her father Avinash Gowda (Avinash) appoints encounter specialist ACP Manoj Menon IPS (Kay Kay Menon), who questions Rithika's male friend Deepak (Deepak) about Prabhu. The guy claims that Prabhu is a drug addict and was always trying to woo Rithika, who started to avoid him because of Prabhu. After that the plot continues when Manoj tries to track Prabhu and his friends. Raute are a nomadic indigenous ethnic group officially recognized by the Government of Nepal. They are known for subsistence hunting of langur and macaque monkeys. They gather wild forest tubers, fruits, and greens on a regular basis. To obtain grain, iron, cloth, and jewelry, they carve wooden bowls and boxes to trade for goods from local farmers. They do not sell other forest products, bushmeat, or forest medicinal plants. Their population is estimated at about 650 people living in small settlements in the regions of western Nepal. Most have been forcibly settled by the government of Nepal but there are about 150 nomadic Raute. Raute are a nomadic ethnic group officially recognized by the Government of Nepal. Raute community in Nepal : They also gather wild forest tubers, fruits and greens on a regular basis. Actual and total Population of Raute in Nepal is unknown. But their home are the thick hilly forest of Dailekh, Jajarkot, Surkhet, Salyan, Kalikot, Achham, Jumla, Makwanpur, Darchula, Baitadi district. Raute Culture in Nepal : Their leader is named as ‘Manbahadur’. All most compulsorily follow the order of the leader. If any one die in this group, the deadbody is clothed and buried, in the net of killing monkeys with property or burnt in their hut and migrate to another place. The Raute are also known as Banraja, raji, Banrawal, Banmanche, Rautya, etc. The Rautes do Nagpuja, Masto Bhairab Puja and Puja of nature. In this ethnic group, the tradition of not doing agriculture, not making permanent settlement and not touching money prevails. The not touching money tradition is changing these days. Rautes emphasize that they wish to remain full-time foragers and not assimilate into the surrounding fanning population. South Indian Movies Dubbed In Hindi Full Movie 2018 New (New Hindi Action Movies 2018, South Movie 2018, New Movies 2018) "ANGEL" starring Hebah Patel & Naga Anvesh. Exclusively on AD-WISE MEDIA ACTION MOVIEPLEX. Nani (Nag Anvesh) is a small-time smuggler who comes across a holy angel called Nakshatra (Hebah Patel). As time passes by, Nani and Nakshatra fall deep in love and start spending quality time with each other. This is also the time when Nakshatra’s dad gets upset with her and sends a special person (Kabir Singh) to bring her back to their fantasy world. What will Nakshatra do now? Will she go back to the place where she came from? How will she convince everyone about her existence? That forms the rest of the story.